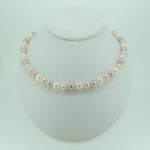 For a very special gift, it would be hard to beat this beautiful cultured freshwater pearl necklace, strung on silk with a knot between each pearl. Each pearl is a staggering 10mm diameter and this gives a radiance and lustre which is stunning on any skin tone and with any dress. 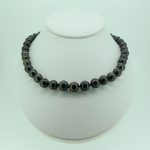 It would look particularly spectacular as a wedding day gift, enhancing any style of bridal gown to perfection. 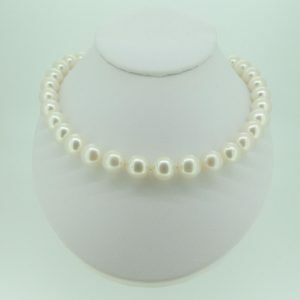 Because pearls are quite fragile in jewellery terms, this lovely necklace comes with its own travel bag, to protect them in transit and in the jewellery box at home.